Welcome to another BEST blog interview. Today I am going to talk to Angela Wehrle in Providence, Rhode Island, the maker of Bound Again Books. She gives old and unwanted books a new life as blank Coptic bound journals, and sketchbooks. Angela's passions are many, as we will learn. She is a versatile craftsperson and designer, fascinated by functional 3D design. Hi Angela, thank you for taking your time for this interview. 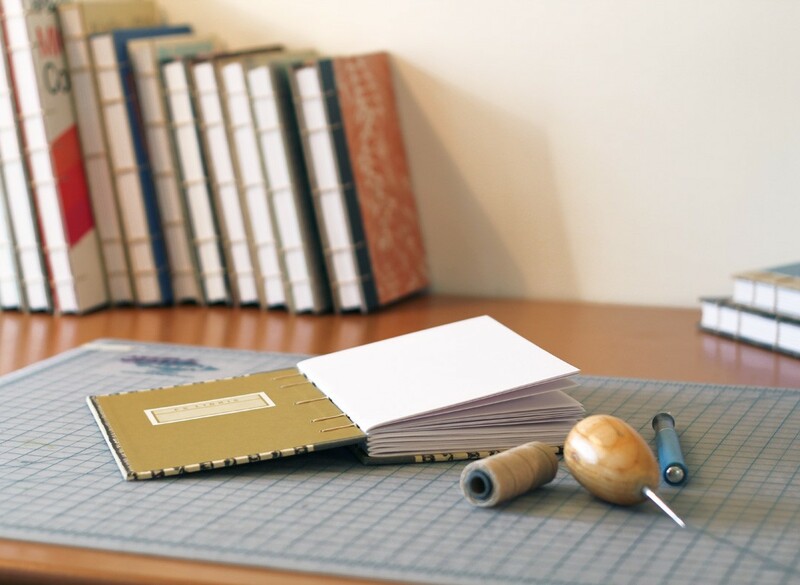 Tell us, how and when did crafting and bookmaking come into your life? I’ve been crafting since I was old enough to hold a pair of safety scissors—as a child I was constantly making things with paper, fabric, yarn, and whatever else I could get my hands on. 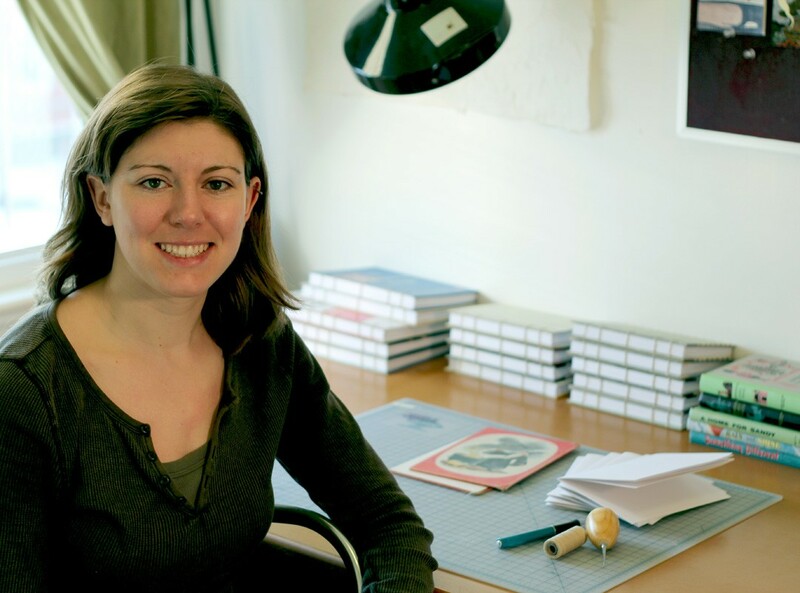 I began “bookmaking” at an early age—in preschool I loved to make folded construction paper books held together with staples, which I would then fill with my own illustrated stories. 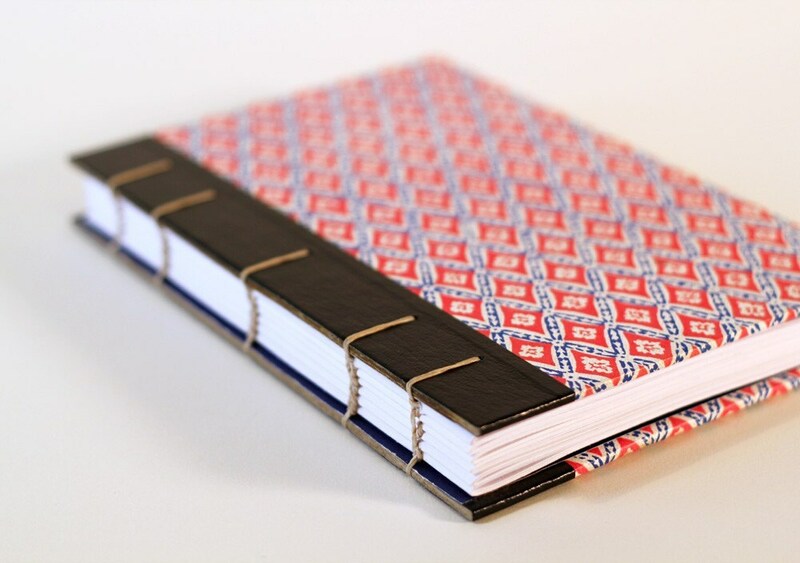 My more recent foray into bookbinding began shortly after I graduated from college. A good friend of mine, who makes all of her own sketchbooks, taught me the Coptic stitch, and from the very first book I was hooked. My first Coptic stitched sketchbook, which I made to use myself, is very special to me. I made it shortly before embarking on a cross-country road trip with my boyfriend, and therefore the first half of the book contains a record of our trip in daily entries, drawings, and pasted-in postcards. 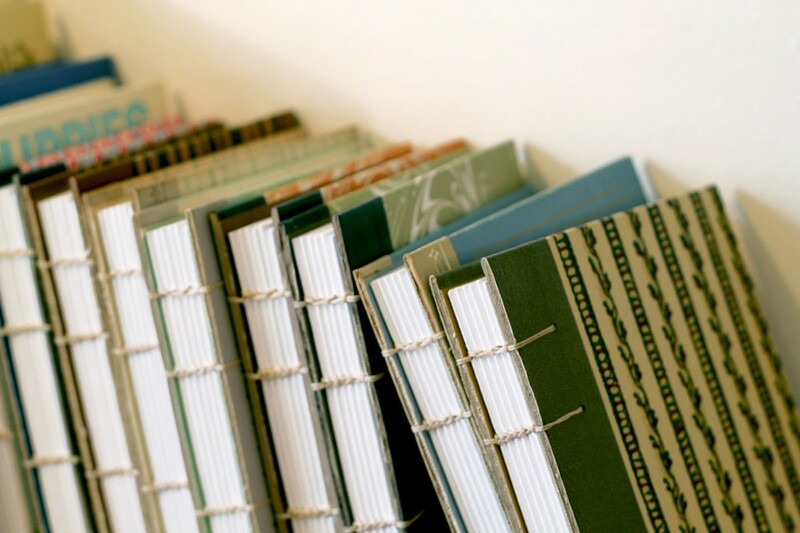 I don’t go through sketchbooks very quickly myself, but I love binding books, so I started making books to sell on Etsy. Yes, I make all of my books out of recycled, thrift store book covers. 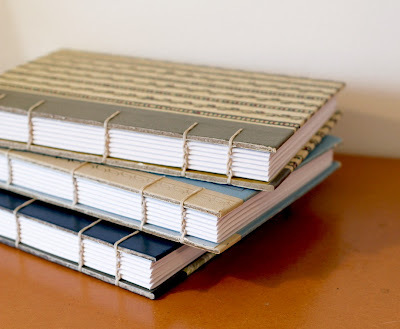 I love the idea of recycling old, unwanted books (which often have awesome patterns and illustrations on their covers) into a new, useful sketchbooks and journals. I like to keep the focus on the recycled covers, so visually I keep the rest of the book fairly simple. 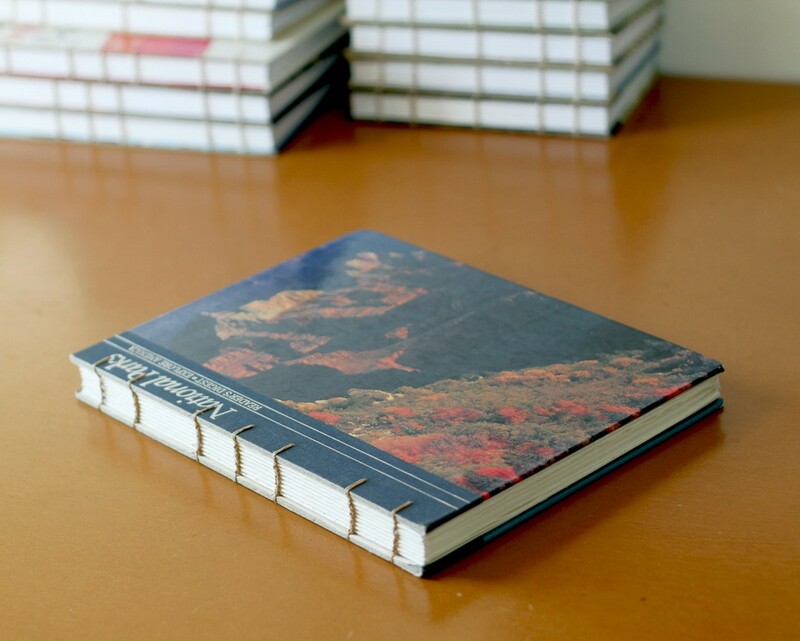 I use high quality, natural-colored linen thread for the binding, and heavyweight, white drawing paper for the pages. I cut, score, and fold all the pages by hand using my trusty X-acto knife and a metal knitting needle as a scoring tool (this works so well I’ve never felt compelled to buy a bone folder!). I always use the Coptic stitch for binding, which I love for its simplicity and strength. Also, I find the fact that it allows the book to open flat an essential feature for a functional sketchbook or journal. Do you have another dayjob, different from being an Etsy-Seller? What is it, and is it connected to your formal training? I came to Providence to get my undergraduate degree at the Rhode Island School of Design (RISD). I chose Furniture Design as my major because I love to make useful, functional objects. Since graduation, I’ve been dappling in jewelry making, taking Continuing Education classes at RISD. My growing interest in metalsmithing led me to my day job as a studio assistant for a small company called Beehive Kitchenware (find them on Etsy), which makes handmade pewter measuring spoons, baby gifts, and holiday ornaments. I absolutely love my day job, and I know that I am picking up valuable, first-hand knowledge about operating a small design business. What do you call yourself: Book Artist, Book Maker, Book Binder - or something else? Why? I have a hard time labeling myself in this regard—or at least deciding on one label. Besides being a bookbinder, I also consider myself a furniture maker, upholsterer, jewelry maker, metalsmith, and on and on. I do like the term “craftsperson” as it can encompass all these specific crafts, and generally alludes to well-made, functional objects. I’ve never really been comfortable with the term “artist” because I don’t find that term as being specific to the idea of functionality. Do I understand correctly that you really made furniture yourself, you not only designed it, but really built the objects? That sounds awesome! Do you still design and make furniture? Yes, while I was at RISD I spent three years designing and building furniture. It was really awesome—I loved having the opportunity as a student to learn a wide variety of skills (woodworking, welding, upholstery, etc.) as well as having access to fully equipped wood and metal shops. Now that I am out of school, I don’t have easy access to machines and tools, but I have made a few pieces here and there. I reupholstered a chair for a friend of mine, and when I moved into my current apartment I built myself a simple kitchen table and a platform bed. I don’t see taking it up as a full time job or anything, but I’m glad that I have the knowledge and variety of skills for when projects present themselves. Thank you, Angela, for this interview! If you want to browse more pictures of Angela's books, furniture and jewelry design, check out her website at www.angelawehrle.com. And of course you can head over to her Etsy Shop and browse the shelves of Bound Again Books. Such an interesting story, Angela. I love your books - they are very neat and you make the most of the re-purposed covers, with the Coptic binding. I like coptic stitch - it is kind-of spare and skeletal, but shows how the book "works". A great interview - thanks for sharing!